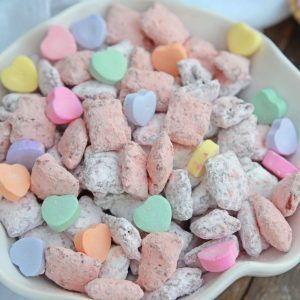 Valentine's Day Puppy Chow transforms a traditional muddy buddy recipe into a festive Cupid Crunch mix! The perfect no-bake dessert for any Valentine's Day party. Measure cereal and place in a very large mixing bowl. Set aside. Over medium heat, melt and combine butter, chocolate chips and peanut butter, stirring constantly. When fully melted, stir in vanilla. Pour chocolate mixture over Chex cereal in 3 stages, folding as you go. Toss gently to coat all pieces. Place powdered sugar and powdered food coloring in a large, airtight plastic bag, shake to combine. If you are using multiple colors, divide between 2-3 bags. Add Chex cereal in stages, tossing to cover and then removing to a wax paper lined rimmed baking sheet. Spread in a single layer and chill for an hour to set. Remove. Keep at room temperture or chilled.